When David Coverdale returned in late 1982 with a new Whitesnake. Only Jon Lord and Micky Moody remained from the old band with Bernie Marsden, Neil Murray, and Ian Paice being replaced by guitarist Mel Galley from Trapeze, bassist Colin Hodgkinson, and drummer Cozy Powell respectively. Micky Moody had actually also left the band and rejoined. 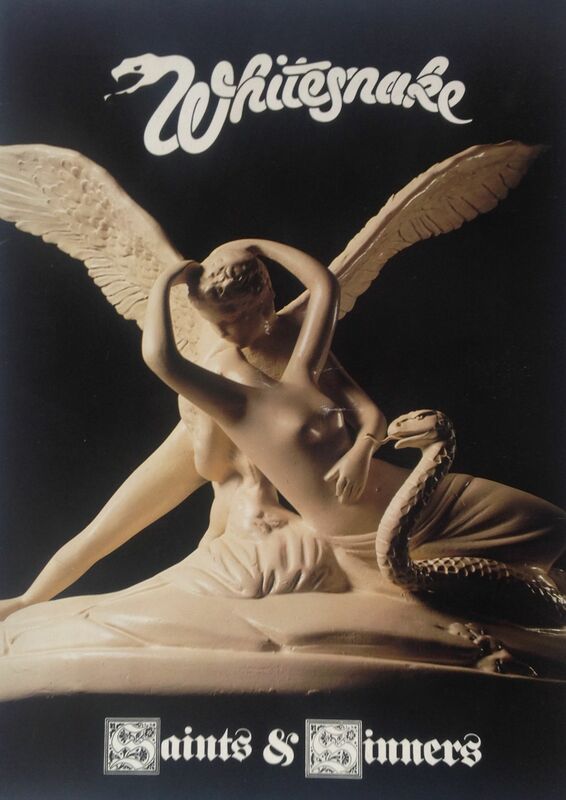 Whitesnake released the album “Saints & Sinners” which was another Top 10 UK album and contained the hit single “Here I Go Again”. Micky Moody explained the changes thus: “By ’81 people were becoming tired. We had too many late nights, too much partying. We weren’t making nowhere near the kind of money we should have been making. Whitesnake always seemed to be in debt, and I thought ‘what is this?, we’re playing in some of the biggest places and we’re still being told we’re in debt, where is all the money going?’. We hadn’t got much money out of it and to be told you’re £200,000 in debt, when you just had six golden albums. It wasn’t just me, cause everybody was getting tired, p***ed off and losing their sense of identity. It was over by then, we couldn’t get any further. It’s difficult for a band to go more than three or four years without getting tired of each other and losing ideas. Nothing lasts forever. Everybody wanted to do something different after a few years, a solo album or write with someone else.” The changing line-up didn’t seem to impact upon the band’s popularity. They toured the UK in late 1982, playing to packed out halls everywhere. 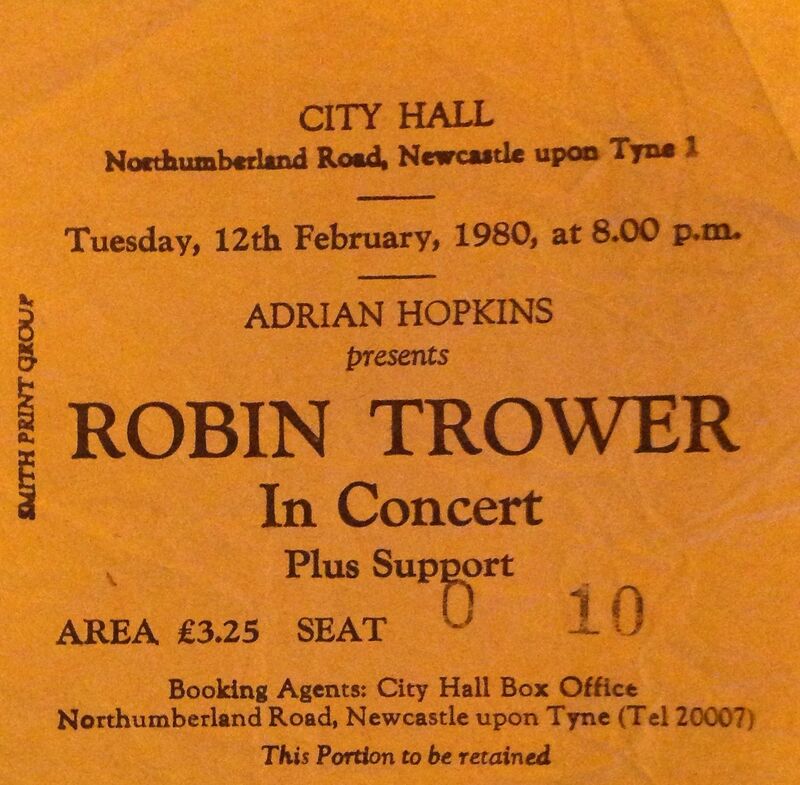 The tour called at Newcastle City Hall for 3 nights, and the concert was as explosive as ever. Support for the tour came from Samson featuring new vocalist Nicky Moore, who had replaced Bruce Dickinson, who’d left to join Iron Maiden. By 1980, the Reading Festival had become a heavy metal extravaganza. 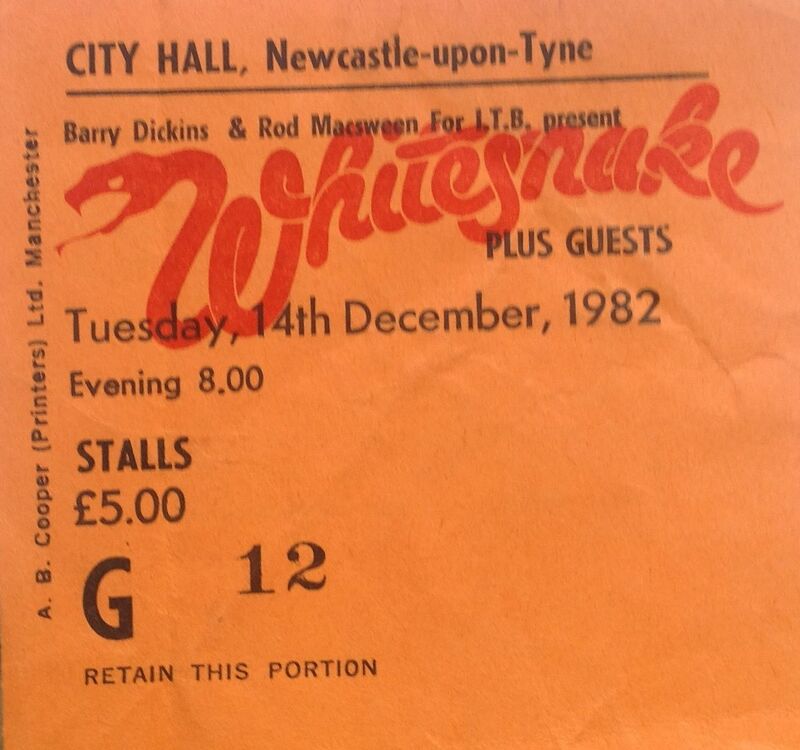 Headliners were Whitesnake, UFO and Rory Gallagher, with a full supporting heavy rock cast including new up-and-coming NWOBHM (New Wave Of British Heavy Metal) bands Def Leppard and Iron Maiden. It was the 10th anniversary of the festival being at Reading, and the 20th anniversary of the national jazz and blues festival. Friday line-up: Red Alert (a heavy rock band, I think and not the North East punk band of the same name); O1 Band; Hellions; Praying Mantis; Fischer Z; 9 Below Zero (a great R&B set); Krokus; Gillan (always a good solid set); Rory Gallagher. The highlight of Friday was, without a doubt, the reappearance of Rory Gallagher. Rory was a hero of mine, a class act, an amazing guitarist, and always came over as a regular down-to-earth guy. By 1980, Rory had moved to a harder rock sound, dropping many of the classic bluesy tracks which had been staples of his set throughout the 70s. So he was no longer playing Bullfrog Blues or Messin’ with the Kid, as part of the main set, although he would sometimes play one or two of them during the encore. Instead his set was focussing on tracks from his most recent albums; Top Priority, Calling Card and Photo-Finish. But these are minor quibbles; Rory’s performance at Reading in 1980 was, as always, outstanding. Highlights were Pat Travers who played an intense set, Iron Maiden with original singer Paul Di’Anno at the time of the anthemic “Running Free” and headliners UFO. UFO had released their eighth album “No Place to Run” and the line-up was Phil Mogg (vocals), Paul Chapman (guitar), Paul Raymond (keyboards), Pete Way (bass) and Andy Parker (drums). I was a fan at the time and it was good to see them headlining, and hear heavy rock classics like “Doctor Doctor” and “Lights Out” and more gentle tracks like “Love to Love”. Sunday belonged to two bands: Slade and Whitesnake. Slade first. Metal legend Ozzy Osbourne was billed to play on the Sunday with his new band Blizzard of Oz, but he pulled out at the last minute and was replaced by Slade. I have already written about Slade’s amazing performance, and have reproduced some of my previous post here. Slade appeared after glam heavy metal band Girl, and just before NWOBHM heroes Def Leppard. The field wasn’t that full as Bob Harris announced that Slade were taking the stage. Their entrance was greeted with a hail of cans. Noddy wasn’t phased at all by that, and asked everyone if they were “ready to rock”. And then they launched straight into “Dizzy Mama”. And then it started to happen. Slowly at first, the crowd began to cheer. People wandering around the outskirts of the site started to run towards the stage. Slade knew they had to win the crowd over and were working so hard, rocking so hard, and playing the hits. The area around the stage was soon completely rammed and the whole field was going crazy. Amazing. Slade nailed it, and in the space of one hour made sure that they were well and truly back. Dave Hill: “One heck of an experience, ‘cos I wasn’t going to do that gig. Slade manager Chas Chandler talked me into it…the confidence came when there was a reaction, as it built and built, sort of got bigger and bigger. I mean getting that lot to sing “Merry Xmas Everybody” was amazing.” The event was recorded and a few tracks were released as an EP. Def Leppard appeared after Slade and didn’t go down too well with the crowd. Joe Elliott: “The legend about us getting bottled off at Reading 1980 is a myth really – we got an encore at Reading. We probably had six or seven bottles of piss thrown up – and maybe a tomato – but it didn’t put us off. That ‘backlash’ was all blown out of proportion. We’re living proof that bad reviews make no difference.” Actually they were pretty good. I got back to the camp site after Whitesnake and discovered that someone had nicked my tent 😦 Oh well, you can’t win them all. It was a cheap crappy tent anyway. This my last visit to Reading. The following year my mates and I decided to stay up North and attend the Rock on the Tyne festival, and once the annual cycle of attending Reading was broken, we never returned. For me, family and the pressures of parenthood kicked in, and the heavy metal dominance within the line-up made the Reading festival seem a little less attractive. I’d been 9 years in a row, seen the emergence of Quo, Genesis and Thin Lizzy, the re-emergence of Slade, great sets by the Faces, Rory and Yes, festival favourites like Edgar Broughton and Hawkwind, my personal favorites like Stray, the introduction of punk and new wave to the bill, and the recent growth in popularity of (new) heavy metal. Over the years I have toyed with the idea of returning to the Reading festival, or going to the more local Leeds festival, but have never got round to doing so. I suppose I fear that if I do, I will feel too old, and too out of place 🙂 I had some great, crazy times at Reading; maybe it’s best to leave the memories as they are. If I did go along, it could never be the same as when I was young. 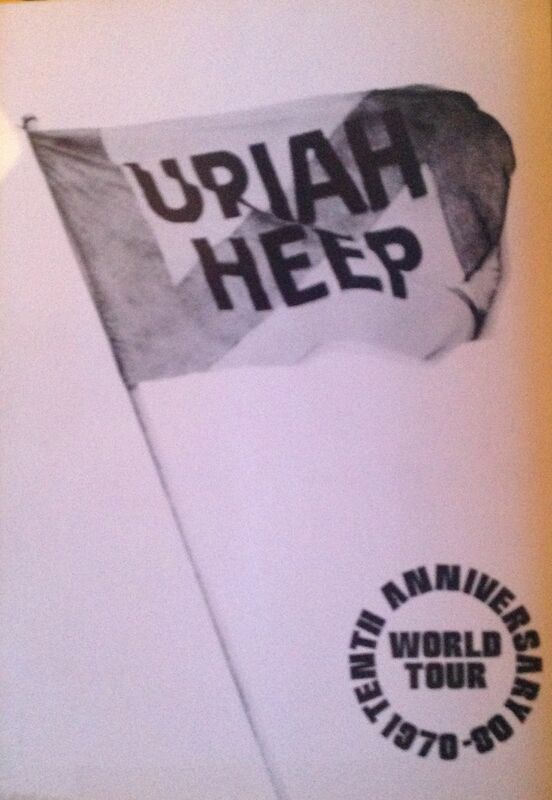 It must have been pretty confusing being a member of Uriah Heep in the late 70s and early 80s. There were so many comings and goings. Let me recap on the Heep saga that I have been telling for the past few days. John Lawton was now an ex-Heepster having been ousted by Heep main man Ken Hensley. Enter a new young guy John Sloman fresh to Heeping, and last seen (by me anyway) singing about the “Bells of Berlin” in the excellent rock band Lone Star. A month or so later long-time drummer Lee Kerslake jumped off the Heep ship. Enter Chris Slade from Manfred Mann’s Earth Band. The new line-up recorded the “Conquest” lp, which was released in February 1980 and went out on their 10th Anniversary Tour, with NWOBHM rockers Girlschool as support. 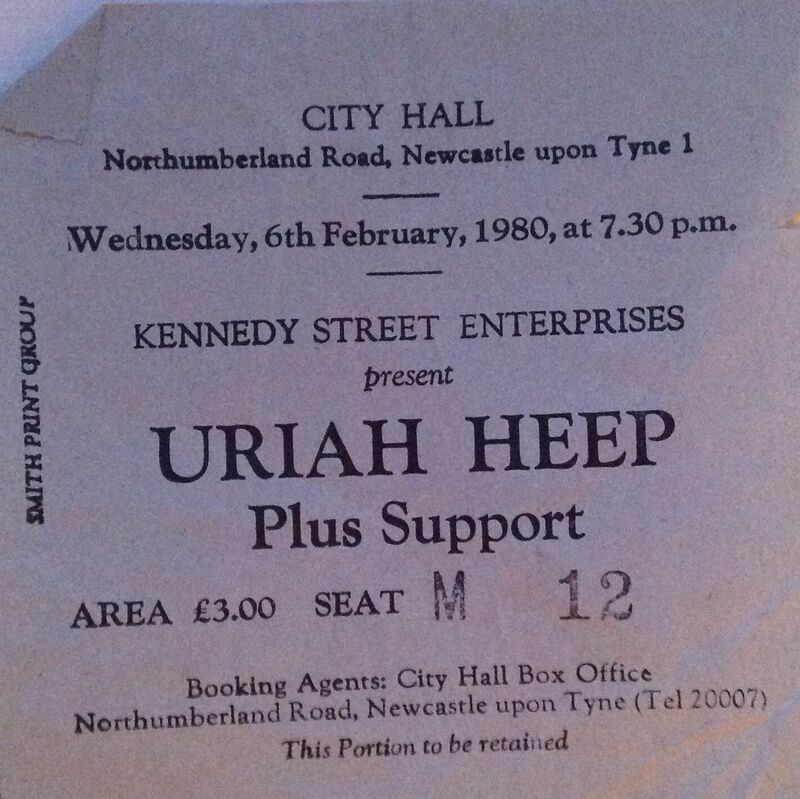 I saw the band at their concert at Newcastle City Hall, and was pretty impressed by the new Heep, who excelled themselves as usual, playing a set of crowd-pleasing Heep classics. Sloman has a pretty impressive vocal range and a great rock voice. Ken Hensley decided to leave the band on June 8th, 1980 after the previous night’s gig in Cascais, Portugal (which marked the end of a huge chapter in the band’s history).T his was probably as big a blow to the future of Uriah Heep as the departure of David Byron had been 4 years or so earlier. Hensley was the main songwriter in the band, and along with Mick Box, one of only two remaining original members. Nonetheless, this was Heep, and change was always happening, so onward they went. Gregg Dechert, a Canadian who had worked with John Sloman, was brought in on keyboards and they immediately went on a UK tour. The tour called at Sunderland Mayfair on 12 Nov 1980, where they were supported by NWOBHM bands Spider and Samson. To be honest I have scant memories of that gig, but think I was present. After finishing the tour John Sloman decided that he had enough of being a Heepster and left the band. At this point Mick Box asked David Byron to rejoin, but David turned the offer down. Trevor Bolder then also decided to leave and joined Wishbone Ash (are you following this ? 🙂 ). The band essentially disintegrated and Uriah Heep were down to one member, Mick Box. More of the Heep saga tomorrow! 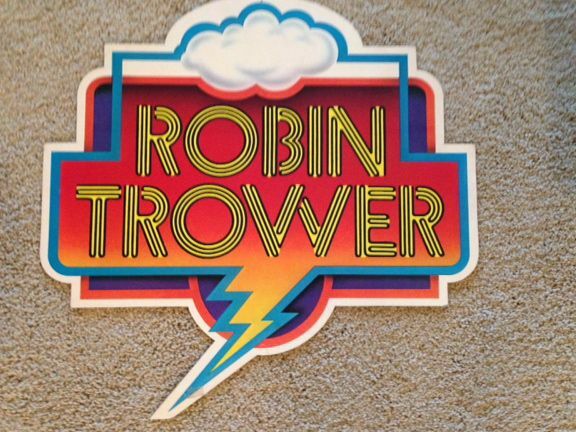 In 1980 Robin Trower released his seventh studio album “Victims of the Fury”, and went out on tour to promote it. Support for the tour was NWOBHM band Samson. I saw the tour was it called at Newcastle City Hall. It was a few years since I’d seen Robin Trower in concert and I was really looking forward to seeing him again. It was the last night of the tour and the band were on their usual amazing form. It is unfair to draw too many comparisons between Trower and Hendrix. Although Trower has undoubtedly been influenced by the master, and has said so himself on several occasions, he has his own unique guitar style, and is himself a true master of the guitar. Sadly whenever conversation turns to classic guitar greats the names of Jimmy Page, Jeff Beck, Eric Clapton, Richie Blackmore, Alvin Lee and Peter Green will be mentioned, but it isn’t that often that Trower gets a mention. That’s a shame because his playing stands up their with those greats. Back to the City Hall concert. It was classic Trower drawing for throughout his solo career and starting with the beautiful “Lady Love”. They also played my favourites “Bridge Of Sighs” and “Too Rolling Stoned”. Great stuff. Set List: Lady Love; The Ring; Day Of The Eagle; Bridge Of Sighs; Jack And Jill; Too Rolling Stoned; The Shout/Hannah; Daydream; Victims Of The Fury; Only Time; Madhouse; Little Bit Of Sympathy. Encores: Messin The Blues; Rock Me Baby. Thanks to John for the image of his Trower “flash”. 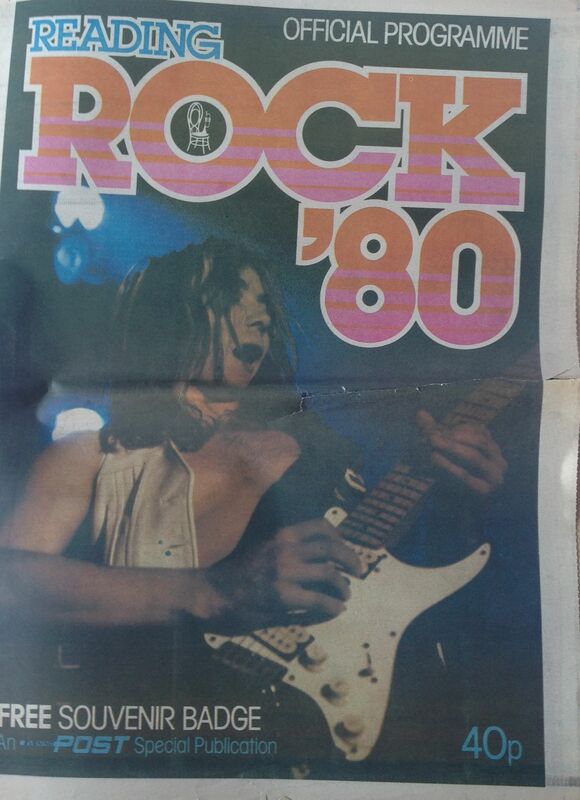 Tomorrow I’ll roll forward and write about a more recent Trower gig. By 1979 the Gillan band had transformed into a much more rocky combo featuring Gillan (of course) on crazy, screaming vocals, the powerhouse man mountain John McCoy on bass, the charismatic Irish guitar wizard Bernie Torme, Colin Towns (from the Ian Gillan Band) on keyboards, and Mick Underwood (who I saw in Strapps as Gillan’s support act a couple of years before) on drums. The Mr Universe album had just been released. This was the Gillan line-up that was to become a familiar feature of festivals and concert halls for the next couple of years. And it was very much a band with three strong front men in the form of Gillan, John McCoy and Bernie Torme; all of whom had their own very different personalities and stage personas. McCoy would prowl around the stage, growling at the front rows of the audience. Torme mixed punk attitude with an almost glamrock image, and some amazingly flashy guitar heroics. I’m pretty sure I saw Bernie Torme once or twice fronting his own punk band, and I remember being quite surprised when he joined Gillan, but the mix worked well. 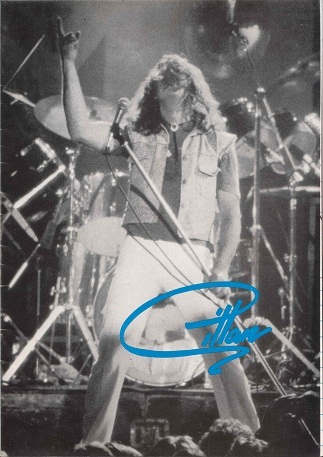 Ian Gillan was the respected classic rock front man, shaking his long hair, and screaming out the vocals. Going along to a Gillan gig was a guarantee of a night of good fun; proper rock, loud music, some humour, some new songs and a few Purple classics. And at least once in the night, Ian would give out a scream that tore your ears apart and seemed to go on for ever. This gig presents yet another conundrum to tax my memory (which as usual fails me). 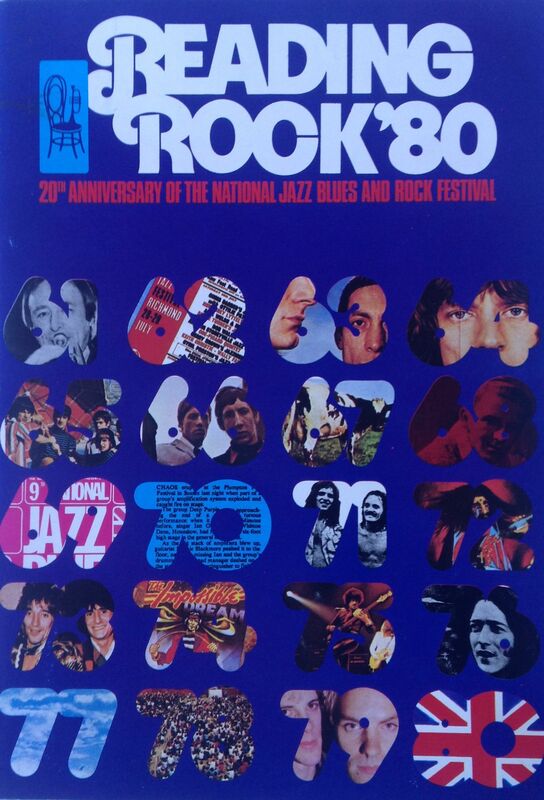 The programme lists the support acts as Samson and the Speedometors, while the ticket says it was Samson and ex-spirit man and Hendrix disciple Randy California. I can’t recall who actually played that night. I certainly remember seeing Samson a few times. They featured Bruce Bruce (aka Bruce Dickinson and soon to be of Iron Maiden) on vocals, Paul Samson on guitar, and Thunderstick on drums, who word a mask and performed from inside a cage. John McCoy and Bernie Torme had both been members of earlier incarnations of the band. I don’t know who the Speedometors were, but they look pretty punky from the picture in the programme. I also saw Randy California a number of times, but I don’t recall if this was one of them. Its funny how doing this blog regularly brings up mysteries for me. 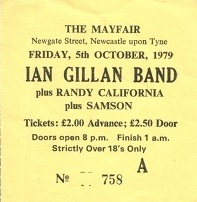 I also note that the ticket calls the band the Ian Gillan band, rather than Gillan; and that the price was a bargain at £2 (in advance).